Annual Phlox (Phlox drummondii) provide color in the garden throughout the season. Noted for their bright, varied colors and versatility, these sturdy plants are easy to grow. An English botanist, Thomas Drummond, found them growing wild in Texas and sent some home in 1835 where they were domesticated over time in English gardens. Eventually they found their way back to a warm reception in the yards and gardens of American homeowners. 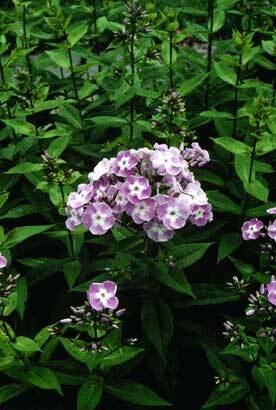 Depending on the variety, annual phlox plants grow from 8 to 20 inches or more tall. There are dwarf varieties that grow to only 8 inches. Some annual phlox grow in low mounds, whereas others spread somewhat. Annual phlox blooms all summer, from June until frost. Individual 1 inch wide flowers are made up of 5 petals and have a flat star-shaped appearance. They grow in tight clusters atop erect stems. Flower colors range from white to pink, salmon, yellow, purple, and mixed. Some have "eyes" of contrasting colors. Others have fringed petals. While they attract butterflies with their vivid colors, they have no fragrance. The leaves of annual phlox are 1 to 3 inches long, smooth and light green. They are narrowly oval to lance-shaped with pointed ends. The lower leaves on each stem grow individually at different heights on the stem, while the upper leaves near the flowers grow in pairs opposite each other on the stem.